Son of the painter Franz Adam. He was born in Milan, where his parents were staying at he time. He assisted his father from an early age and like his father he was best known for depicting battles. He witnessed Radetzky's campaign in Italy in 1848/1849 and the Franco-Prussian War in 1870/1871. In 1859 he painted a scene from the Battle of Solferino. Among his pupils were Josef Brandt and his nephew Emil Adam. 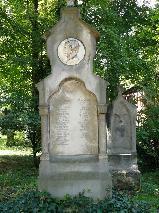 The grave of Benno and Eugen Adam at the Alte Südfriedhof, München.